By now you’ve probably heard of our HIP Pack packing parties, those twice-a-month events where volunteers gather to assemble hundreds of weekend food packs (a.k.a. HIP Packs) for students at our partner schools. What you might not have heard of, however, are all the little behind-the-scenes roles that go into these large-scale events, and all the consistent volunteers who keep the ball rolling. There are the school faculty and PTA members who coordinate pack numbers and pick-up times, the volunteers who help deliver donated and purchased foods, the other volunteers who repackage bulk foods into individualized portions, and the still more volunteers who organize the packs once they are assembled at the packing parties. The latter role is the domain of volunteers like Xander and Jonathan, who came onboard earlier this year. 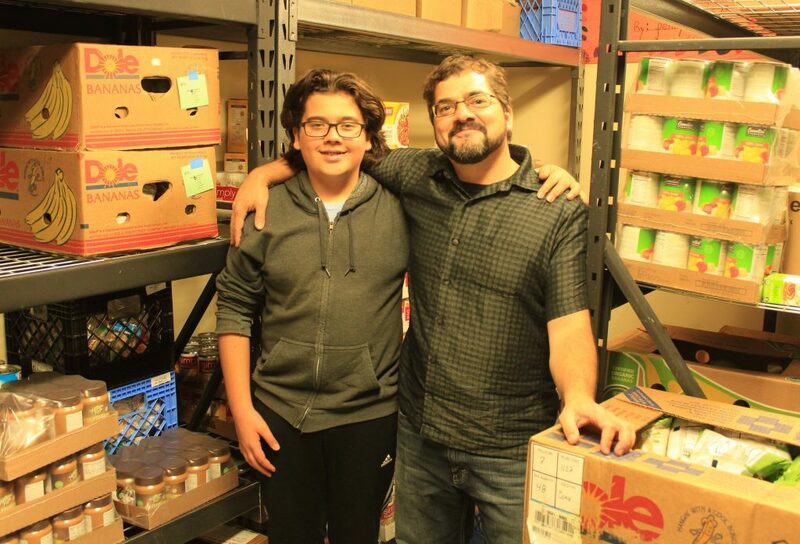 This father and son duo likes to operate somewhat behind-the-scenes, making sure the assembled packs are organized properly so that they can get to their destinations. And their work has been incredibly invaluable to HIP. As one can imagine, packing parties can get pretty hectic, with 15-35 volunteers in an assembly line spitting out an average of 375 packs in an hour and a half. That’s why it’s so helpful to have people like Xander and Jonathan, who take the influx of packs and organize them into boxes based on their designated schools. “It’s impressive to see how much food comes through before you even box it up. All the store rooms are full of stuff every week to be able to pack,” notes Jonathan. With all that product, it would be easy to become overwhelmed, but in taking on “the glorious leadership of the storage room boxes,” Xander and Jonathan help alleviate the stress that might make packing parties more of a chore. It also helps that they have been doing this for almost a year now. While we hope that our work is no longer needed by that time, it’s good to know that we have such amazing volunteers in our corner. From all of us at HIP, thank you!